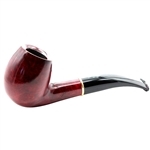 Apple Appia Italian Briar Pipe - Made In Italy from High Quality Itailian Briar. Each Pipe is stamped with: Italy and also has the Stamped Makers Mark. The bent stem is made of Lucite and has a Double Style Silver Trim ring.